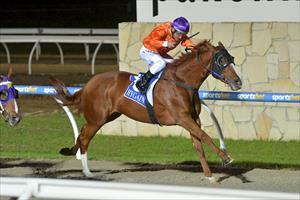 Making things easy never appears to be in Red Velvet Swing's bag of tricks, and her win in Thursday night's 1600m maiden at Pakenham was no different. Living in the shadow of famous siblings has led to expectations for the Star Witness filly as she is a half-sister to dual Group 1 winning sire Stratum Star and a full sister to multiple black-type performed Serenade. However, Red Velvet Swing finally shrugged the monkey off her back and joined her family members as winners at her 14th start thanks to a masterful performance from jockey Damien Oliver. Sent out short-priced $1.90 favourite after finishing a luckless second over the course and distance the previous Thursday, it appeared all was lost at the start of the maiden event when Red Velvet Swing blew the start and Oliver was forced to have her bailed up three-back on the fence in running. Rounding the turn, Oliver plotted a path behind second favourite Danger In Devon and after being held up for a time between the 200-300m, the Hall of Fame jockey pushed her through a tight gap between runners and the three-year-old burst to a narrow victory. "She was due to get some luck," Oliver said post race of the late split. "She is a filly that has always seems to have things go against her and tonight it looked like it was going to be the same after her slow getaway, but we we were able to track into it well and she got the job done nicely after getting clear." "She will be better suited at 2000m and hopefully this win can give her the confidence to go on with it." Thanks to Super Vobis bonuses this win took Red Velvet Swing's career prizemoney past $50,000, which sounds easy work after just breaking her maiden.